To become a legend you need legendary weapons. A power bank is one of those weapons. Even though the frenzy around Pokemon Go has died down a bit in the last couple of weeks, that doesn’t change the fact that Pokemon Go augmented reality mobile video game is the most downloaded game of all time by a long margin. 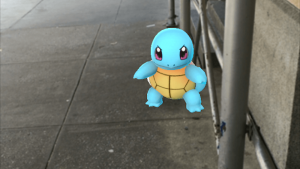 Pokemon Go makes use of augmented reality to show you PoGo (Pokemon Go) monsters in real life through the lens of your smartphone’s display screen. PoGo players are required to search for different PoGo monsters and then capture them by throwing Poke Balls at them. You can also choose to level up your PoGo monsters or just catch all the different PoGo monsters the game has to offer. There is also a social element to the game as catching PoGo monsters with friends doubly increases the fun in playing PoGo. Pokemon Go basically forces you to get up off your couch and move outdoors. If you don’t move a lot, the game won’t show you more monsters. And if you don’t catch more monsters, you won’t be able to level up with your friends. You can also form a team with your friends and take down Poke Gyms. Poke Gyms are basically these monuments in the game which allow PoGo players to train their monsters and fight other PoGo monsters. Pokemon Go was developed by a studio that goes by the name of Niantic Labs. The algorithm behind the augmented reality game boils down to two simple things. Niantic Labs’ servers determine the position of a particular PoGo player through the use of user’s smartphone GPS and a Wi-Fi connection. Then the servers show that player different Pokemon Go monsters according to his/her position on the globe. The monsters that any PoGo player encounters depends on the level of the trainer of that particular Pokemon Go player. All of this is great. Except that, the augmented reality game takes a huge toll on your smartphone’s battery. And since you can’t legally play Pokemon Go from the comforts of your bed or even your home, chances are that if your smartphone’s battery dies, you get stuck while hunting PoGo monsters out in the wild. Moreover, you must understand that Pokemon Go uses an augmented reality feature that shows you PoGo monsters on your smartphone’s screen by combining some animations with an instantaneous video feed from your smartphone’s camera. And while seeing a PoGo monster just on the side of the road on your smartphone’s screen is cool, the features eats up your smartphone’s battery fairly quickly. And don’t you just hate the moment when you’re about to catch your last Pikachu before you can evolve your Pikachu and Raichu and suddenly before you can throw your first Poke Ball, your smartphone’s battery goes dead? Not to mention that if that happens to you, you’ll have to walk back home without being able to do anything with your smartphone since all its juice would have been consumed by Pokemon Go. So if you want to avoid that situation, then you need to invest in a power bank. More specifically a portable power bank for your smartphone can keep your juiced up long after your smartphone’s battery is dead. The two main advantages of having a power bank handy in your backpack or pocket at all times is that, a power bank allows you to take longer trips for hunting more PoGo monsters and once you have sighted a rare Pokemon Go monster, you can be sure of the fact that your smartphone won’t give up on you just as you are about to capture a Pokemon Go monster with one last through of a Poke Ball. This charger has the shape of a Pokeball which is great if you want to look the part of being the ultimate Pokemon Go master. It has a battery capacity of 12000mAh which means that you can charge your typical smartphone about three to four times over. With this power bank, you will never have to worry about going out of battery while hunting your favorite Pokemon Go monsters. It also comes with a double USB port 2.4A. It can also perform a Fast Charge and a Quick Charge with the help of a USB cable. The batteries are standard Lithium-ion batteries so don’t have to worry about the charger taking ages to charge after you have used up all its juice. As far as physical dimensions go it has a diameter of 83mm since it comes in the shape of a ball rather than your traditional brick looking power banks. The Esna power bank also comes with a LED light that indicates the state of the charging process and the power bank has a capacity of 10000mAh. This means that this power bank when fully charged, can charge your smartphone three times over when in need. It is perfect for use with smartphones when you’re playing heavy augmented reality games like Pokemon Go. It comes with a chain and a USB cable. The ball is made of an insulated plastic enclosure to help prevent extreme external temperatures. So you can use this power bank out in the sun without the fear of burning your hands. It weighs around two pounds and measures 3.6 x 3.5 x 3.5 inches. This charger has a charge capacity of 10000mAh and hence is ideal for when you want to go distant places for those rare, hard-to-catch monsters. It has a keychain for your smartphone and comes with a LED light. It can charge an iPhone 6 about 2.5 times and can also charge two smartphones at the same time. It has a 3.5-inch diameter and has a beautiful sling that can prove useful while holding and handling the Poke Ball power bank. It is also compatible with iOS and Android smartphones so you don’t have to worry about charging your friends smartphone which might or might not be an Android/Apple smartphone. This power bank has a capacity of 10,000mAh and comes in a special purple Poke Ball color. The purple colored Poke Ball is the ultimate master ball as far as the game’s universe is concerned. The power bank is shipped with its original box and has a USB cable to go along with it. Just like most Poke Ball power banks, this power bank also has a diameter of 83 mm which makes it, essentially, an ultra portable power bank. A power bank mobile phone charger can be a great gift for your friends, family and relatives who enjoy playing battery-heavy augmented reality video games such as Pokemon Go. And with the holidays coming up very soon, who knows who might call you up and thank you for the power bank which enabled them to catch that one last Magikarp.